← Rain/Wind event expected across PEI next couple days..
Rain/Wind event today/tonight across PEI..
Saturday, November 3rd 7:00am.. An intensifying low pressure system located near New York City this morning will move NE to be located over Gaspe Penn tonight then into Labrador by tomorrow morning. A warm front extending NE front this low will move across the island later this morning. Easter;y Winds will shift to the south in response to the frontal passage and temperature will climb into the mid/high teens. Rain will continue and become heavy at times as the low itself approaches along with increasing southerly winds which are expected to peak near midnight with gusts to 100 KMH especially along the south and west coasts as well over higher hilltops. The associated cold front will then sweep eastward across the island late this evening which will bring an end to the rainfall as well as a winds shift to the west. Winds will slowly shift to the NW during the overnight hours and begin to slowly diminish tomorrow as the storm center pulls away over Labrador. An area of high pressure will then begin to build in form the west cresting over the island near noon on Monday. Sunshine and calm winds will accompany this feature. Clouds and showers are quick to return on Tuesday as a frontal system moves though. 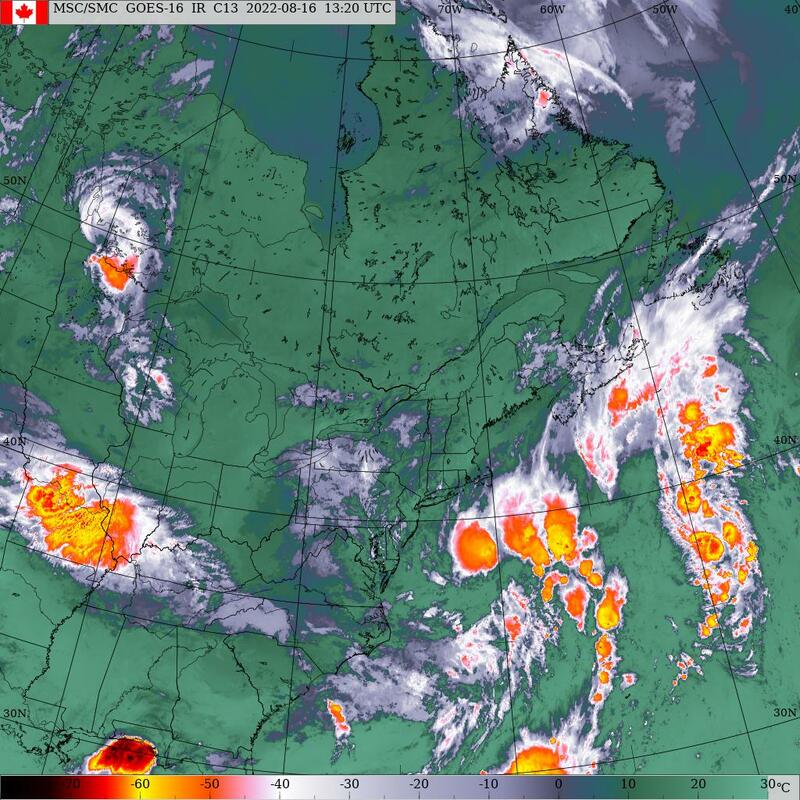 A strong low pressure system will be moving northward through the Great Lakes with it’s associated warm and cold fronts extending eastward into the Maritimes on Wednesday. This will set the stage for more cloud and rainfall along with brisk-strong wind. High pressure builds in from the west cresting over the island Thursday night into Friday morning. Clouds will once again be on the increase During the day on Friday with rain developing by evening as the next weather system moves through. Finally a break from the active weather as a large area of high pressure builds in but temps will be much cooler as well with onshore clouds and flurries a good possibility through the weekend and into early next week. Precipitation.. Heavy rain expected today ending abruptly this evening giving an additional 20-30 mms. Dry for Sunday and Monday. Could be a shower on Tuesday. Periods of rain on Wednesday. Dry Thursday. Rain redevelops on Friday into early Saturday. Basically dry from Saturday through Wednesday but can’t rule out some isolated showers/flurries in the onshore NW winds. This will be more of a local effect for down east. Up-west could see 5 days of sunshine. Temperatures.. Gonna get warm today then cool off abruptly this evening with the cold frontal passage. Normal temps are expected tomorrow and Monday followed by another warm-up for Tuesday and Wednesday. Back to normal/above normal for Thursday and Friday. Sharp cool down Saturday morning leading to below normal temps for the remainder of Saturday into Sunday-Tuesday. So fairly mild next 7 days..The cold weather arrives next weekend.. Hazards.. Wet driving conditions in heavy rain today.. Strong south winds developing today peaking between 9:00pm-3:00am with gusts to 100 KMH especially along the south and west coasts as well as up slopping bare fields and high hilltops. The leaves for the most part have fallen but ground is saturated so trees falling on power lines still a good possibility resulting in power issues. Expect to see travel restrictions on he Bridge this afternoon as the winds increase. Plan accordingly. Watches/warnings.. A warning warning has been issued for the island and a special weather statement remains in effect for heavy rain today..
Tonight.. Heavy rain ending mid evening then partial clearing after midnight. Winds further increasing to S-SW-W winds gusting to 100 KMH later this evening, Temps steady 16 through this evening then falling sharply before midnight to 5 by dawn.